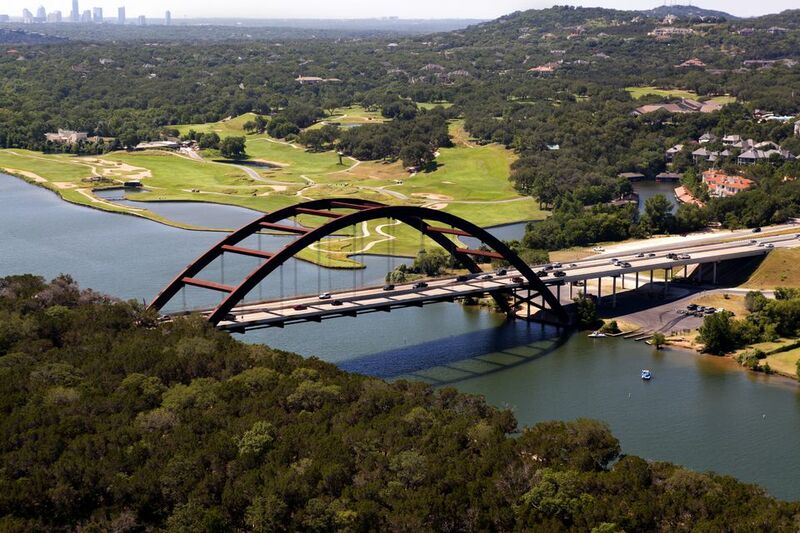 Also known as City Park, Emma Long Metropolitan Park encompasses 1,000 acres along Lake Austin. The main attractions are the sandy beach, a mile of lakefront, and abundant wide-open spaces that are ideal for tossing around a football or Frisbee. There’s a small swimming area that’s protected from passing boat traffic, which can be heavy on summer weekends. The park also occasionally hosts large festivals, fun runs, and other events, so you may want to call ahead if you’re looking for a quiet getaway. The drive from central Austin to Emma Long Park along RM 2222 is best appreciated at a slow and leisurely pace. (Also, it would be dangerous to go too fast because of all the twists and turns.) As you head west, the hills get hillier and the views become more dramatic at the top of each hill. The off-white limestone cliffs are contrasted by the green of cedar and oak trees. Some hillsides are covered in high-end houses, while others are still in a natural state. There aren’t many safe places to stop, though, so the passengers might enjoy it more than the driver. Equipped with 68 barbecue pits, the park is well suited to large family or group gatherings. Other facilities include 151 picnic tables, 66 campsites, four sand volleyball courts, a basketball court, and a fishing pier. Restrooms are available behind the concession stand near the waterfront. Many of the campsites along the water are shaded by towering larch, pecan, and cottonwood trees. Spot Wildflower and Wildlife: In springtime, bluebonnets, Indian paintbrushes, and other wildflowers bloom in many of the open areas. The “edge” zones between the forest and open areas are excellent places to spot some of the park’s birds. You may even spot the highly endangered golden-cheeked warbler. At night, particularly in spring, the coo-like calls of barred owls echo throughout the park. Red-tailed hawks and turkey vultures are also common in the area. Play a Sport: The green space between the woods and the water is about the size of a football field. If you can put together enough players, you could play football, soccer or just about any team sport on the space available. As night falls, just be mindful that there are also campers nearby. Cast a Line: Fishing for bass is another popular pastime on the lake. The current record size for a largemouth bass caught on Lake Austin is 16.03 pounds and 28.25 inches. The biggest fish of any species ever caught in Lake Austin was a whopping 70.5-pound smallmouth buffalo landed in 2008. While you might have better odds if you can get access to a boat and cruise around the lake, a surprising number of record holders have caught their fish from a pier or the shoreline. Go Hiking: If you like to hike in groups, check Meetup.com periodically for group hikes, dog-friendly hikes and bird watching outings at Emma Long. Several of the groups meet early in the mornings before the crowds arrive. If you need a little variety in your exercise routine, there are also informal fun runs just about every weekend that are organized through Meetup.com. If you’re into “geocaching,” there are several groups that stash little items around the park for others to find using clues and GPS. While most park officials have come to embrace geocaching, a few old-timers still see it as basically littering. If you leave something, make sure that the general area around the stashed item appears all natural. The item is supposed to be hard to find anyway; that’s part of the fun. The park is popular among dog owners because of the leash-free, 2.5-mile trail that winds back and forth across a creek and through a dense forest. Even in the brutal heat of summer, the thick canopy overhead provides a cool escape for hikers and their canine companions. Make sure your dog is accustomed to dealing with other excited animals before bringing it here. The curvy nature of the trail means that dogs can appear suddenly, which can cause nervousness or even hostility in skittish pets. Also, if your dogs not used to being off-leash, it could easily get excited and run off into the dense wooded area along the trail. If your pup is highly excitable, you may want to keep it on leash for a while and see how it goes. Depending on recent rainfall, the creeks may or may not be flowing on any given day, so be sure to bring plenty of water for you and your dog. There are no restrooms along the trail. In another area of the sprawling park, far from the dog trail, there are nine miles of trails designed specifically for mountain bikes and motorcycles. Most of the climbs are not too steep, but expect a bumpy ride. In addition to the random rocks strewn about the undeveloped trail, bikers will have to navigate boulder-sized “steps” made of rough limestone. Exposed cedar tree roots along the trail can also be hazardous if you’re not paying close attention to the terrain. After a relaxing day of boating or swimming at Lake Austin, these eateries are great spots to grab a bite and watch the sun go down. Ski Shores Cafe: A casual burger joint on Lake Austin, Ski Shores has been a favorite weekend destination for Austin families since 1954. It can get fairly busy on weekends, but even the wait is pleasant while lounging next to the lake sipping a beer. There’s also a play area for the kids. If you want to go directly from swimming in the lake to having a burger and a beer without bothering to change, this is the best choice. Most of the customers wear little more than bathing suits and towels. Ski Shores often has live bands playing in the evenings. Hula Hut: Featuring an odd combination of food dubbed Polynesian Mexican, Hula Hut is a festive, multi-level eatery with an outdoor dining area over the water. The outdoor area also features a large U-shaped bar that can get rowdy on weekends. A small dock is available for people arriving by watercraft, and on occasion, these boaters arrive already in an intoxicated state. The people watching is always first-rate. For starters, don’t miss the mango-poblano chile quesadillas—a perfect combination of sweet and savory. The grilled Hawaiian chicken is another cultural mashup, served with pineapple, Monterrey Jack cheese and Polynesian plum sauce. Abel’s on the Lake: A two-story structure with several indoor and outdoor areas, Abel’s is right next door to Hula Hut. Serving massive burgers and hearty breakfast plates such as chicken and waffles, Abel’s is usually slightly less crowded than Hula Hut but also a little more expensive. Their oysters on the half shell are consistently fresh and worth the price. The restaurant also has a small boat dock. Mozarts Coffee Roasters: In addition to serving excellent fresh-roasted coffee, Mozart’s has amazing desserts, ranging from red velvet cake to decadent cheesecakes and tiramisu. The dog-friendly patio is right on the lake. Plus, there’s free wi-fi for those who want to pretend to work. During the Christmas season, the shop presents an over-the-top light show every night. Parking can be a hassle due to the close proximity of both Abel’s and Hula Hut. County Line on the Lake: Built out of an old lake lodge, County Line is rustic, laid-back and family-friendly. The pork ribs and brisket regularly earn high praise from diners. Expect generous helpings of everything, but leave room for the peach cobbler. Groups can save a little cash by ordering the meal family-style. Instead of individual plates, dishes are served on large platters, to be passed around. Perched on a quiet portion of the lake, the restaurant even has a little walkway along the water where you can walk off your meal and watch the turtles and ducks. Note: While some camping facilities are available, keep in mind that the park is minimally staffed at night. Since most of the traffic here is during the day, the earlier hours are clearly a higher staffing priority. The good news is that civilization isn’t far away if you have an emergency or need supplies. The FastMed Clinic on North Lamar might be a good option for non-acute situations. For a true emergency, call 911. There aren’t many full-service grocery stores in the area, but there is a 7-11 a few miles away on 2222. If you want to pick up groceries before leaving central Austin, there’s a large HEB grocery store at the corner of Burnet Road and 2222.